The American Kanner Architects have designed a see-through house overlooking the ocean in Long Island, New York. Called Long Island House, the building will be raised above the ground and have glass walls to allow views through from every side. 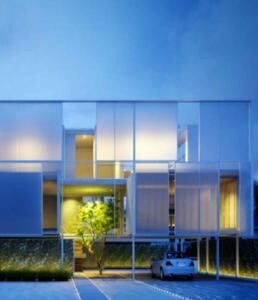 Expansive walls of glass create a see-through house from almost every direction even for rooms relegated towards the back. Each individual room is given multitudinous views as well. This visual transparency translates into a physical model for natural cross-ventilation in almost every direction throughout the house. The office, considered one of the more important spaces, sits front and centre with 180 degree views of the ocean while overlooking the livingroom’s 6.6m high space. Framing the entire house is a delicate, steel “exo- skeleton” that ties the exterior together into an implied cubic volume. Privacy is softly regulated by sheer white PVC mesh or “veils” attached within the framework, especially in the more exposed areas. At night, the house becomes a glowing white lantern with brief glimpses of domestic activity beyond.